At its founding in 1930, the Woods Hole Oceanographic Institution joined a thriving ocean science community in the village of Woods Hole, Massachusetts, that included the Marine Biological Laboratory and the National Marine Fisheries Service. At the time, the world was only a little more than 50 years removed from the first efforts to systematically study the ocean. One of WHOI’s greatest contributions came even before a single building was constructed: As a result of the discussions and correspondence that surrounded planning the Institution, scientists formed a vision for oceanography that foresaw experts from many fields working together on questions related to the global ocean—one that continues to the present day. The idea for WHOI dates to the early 1920s and the first of a series of conferences between Frank R. Lillie, then the MBL director, and Wickliffe Rose, then president of the Rockefeller Foundation’s General Education Board. Their discussions resulted in the 1927 appointment of a National Academy of Sciences Committee on Oceanography “to consider the share of the United States of America in a world-wide program of Oceanographic Research.”The committee, chaired by Lillie, recommended that oceanographic activities on the West Coast be strengthened and that a well-equipped oceanographic institution be established on the East Coast. The committee members, including its secretary, Henry Bryant Bigelow of Harvard University, formed the nucleus of a board of trustees for the new institution. Lillie became president of the board, Bigelow WHOI’s first director. After considering many sites, Woods Hole, Mass., was chosen for its established scientific research community, extensive library facilities, ready access both to the deep sea, to the contrasting conditions north and south of Cape Cod, a small but deep water harbor suitable for berthing oceanographic vessels, and its proximity to several universities.The Rockefeller Foundation provided $1 million for construction, boats, equipment, and upkeep, $1 million for endowment, and $500,000 for 10 years of summertime operating expenses. Bigelow had conducted extensive studies in the Gulf of Maine using boats begged and borrowed from the Fisheries Commission and often not suited for the work being done. He knew firsthand the importance of a seaworthy and reasonably comfortable working platform. “The most essential activities of the institution may be expected to center around the work at sea,” wrote Bigelow. That statement eventually formed the centerpiece of the Institution’s longest-lasting (and continuing) legacy, one rooted in seagoing research to further knowledge of the ocean.In May 1930 the trustees authorized $175,000 for construction of a new vessel, a 142-foot, steel-hulled ketch spreading 7,500 square feet of canvas eventually christened Atlantis. Construction also began on a four-story brick laboratory, which is still in use and today called the Bigelow Laboratory. Atlantis was launched December 31, 1930, and arrived in Woods Hole in August 1931.Throughout the 1930s, the Institution operated primarily during the summer months. A typical summer would find Atlantis exploring newly discovered canyons off Georges Bank, collecting mud cores for bacteriological studies, taking current measurements at anchor stations, dragging for Gulf of Maine shrimp, collecting plankton, and crisscrossing the Gulf Stream taking water samples and making hydrographic measurements. During the winter, Atlantis generally made a longer cruise or two to the Caribbean or Gulf of Mexico.The turn of the decade, however, brought profound change to oceanography. During the war, the U.S. Navy realized that many of its operations were intimately dependent on the environment in which ships operate, and oceanographers found themselves consulted more frequently on matters of national defense.One of the first Navy-sponsored programs of research at Woods Hole concerned the composition of different paints to prevent marine fouling on ships, a project for which the Navy commended associate director Albert Redfield for helping them save an estimated 10 percent of their fuel budget. Another project involved the intensive study of the effects of salinity and temperature on the transmission of underwater sound and its application to anti-submarine warfare. Many other research activities with direct application to naval problems followed, the largest of which was the investigation of underwater explosives.After the war, there was a period of uncertainty about oceanography’s future. For a while it appeared that the Institution might return to the pre-war routine of busy summers and quiet winters. 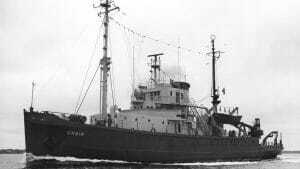 But both the direction of oceanography as a science and its economic situation had changed, as had the demand for advanced research in the U.S.Throughout the Cold War, the Navy supported additional research that spawned greater knowledge of planetary and marine processes. Extensive work in physical oceanography led to better understanding of the Gulf Stream as well as the distribution of physical and chemical properties in the North Atlantic Ocean. Acoustic methods stimulated by wartime research allowed geophysicists to extend their knowledge and understanding of the structure of Earth’s crust under the ocean basins. Interest in meteorology led to the development of a strong group at Woods Hole making observations on trade wind physics and dynamics. In 1950, the U.S. Congress established the National Science Foundation (NSF) to promote national efforts in science and engineering. 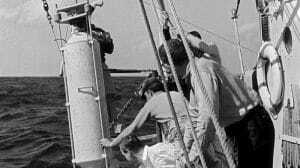 WHOI’s first support from NSF came in 1952 for work on summer plankton blooms in Long Island bays and for eight training fellowships. Over the years, NSF’s share of Institution support grew slowly and steadily until it surpassed Navy support. But the Navy remained pivotal in two areas: ship-based oceanography and underwater vehicles. In the late 1950s and early 1960s, the Navy supported development of a manned submersible for scientific research. Eventually named Alvin for one of its prime advocates, Allyn Vine, Alvin continues to take geologists, biologists, and chemists deep beneath the surface of the ocean to observe processes and phenomenon firsthand that would be difficult or impossible to study otherwise. The Navy also continues to support sea-going ocean science through the construction of oceanographic research vessels. WHOI’s two Global Class research vessels, R/V Knorr and Atlantis are both operated by the Institution on behalf of the Navy, which paid for their construction. Another in the long line of research vessels operated by WHOI is scheduled to be delivered to the Institution in 2015. WHOI’s leadership in ocean science and engineering has resulted in a long line of notable discoveries and advancements in knowledge of the ocean. These range from the distribution and role of microbes in the marine environment to development of revolutionary new tools and techniques to study the ocean to the discovery of life in the deep ocean near hydrothermal vents to a deeper understanding of the nature and impacts of hydrocarbons in the ocean. In addition to scientific research and technical innovation, education has been a critical part of WHOI’s mission over the years. The first formal education program was a summer research experience for undergraduates initiated about 1955. Postdoctoral fellowships followed in 1960, and the long-running flagship of WHOI’s education program, a Joint Program in Oceanography with the Massachusetts Institute of Technology, was begun in 1968 to grant doctoral degrees to students interested in pursuing a career in ocean science or engineering. Today, the WHOI community numbers over 1,000, including scientific and technical staff, ships’ crew and officers, and a variety of scientific, service, and administrative support staff, as well as about 130 Joint Program students. All of these individuals contribute to a common goal: to help advance research and understanding of the ocean and its role in shaping and sustaining the planet. It is not a mission that WHOI takes lightly, now or at any time over the course of its history. The ocean is too important to all of us. The idea for WHOI dates to the early 1920s and the first of a series of conferences between Frank R. Lillie, then the MBL director, and Wickliffe Rose, then president of the Rockefeller Foundation’s General Education Board. Their discussions resulted in the 1927 appointment of a National Academy of Sciences Committee on Oceanography “to consider the share of the United States of America in a world-wide program of Oceanographic Research.”The committee, chaired by Lillie, recommended that oceanographic activities on the West Coast be strengthened and that a well-equipped oceanographic institution be established on the East Coast. The committee members, including its secretary, Henry Bryant Bigelow of Harvard University, formed the nucleus of a board of trustees for the new institution. Lillie became president of the board, Bigelow WHOI’s first director. After considering many sites, Woods Hole, Mass., was chosen for its established scientific research community, extensive library facilities, ready access both to the deep sea, to the contrasting conditions north and south of Cape Cod, a small but deep water harbor suitable for berthing oceanographic vessels, and its proximity to several universities.The Rockefeller Foundation provided $1 million for construction, boats, equipment, and upkeep, $1 million for endowment, and $500,000 for 10 years of summertime operating expenses. Bigelow had conducted extensive studies in the Gulf of Maine using boats begged and borrowed from the Fisheries Commission and often not suited for the work being done. He knew firsthand the importance of a seaworthy and reasonably comfortable working platform. “The most essential activities of the institution may be expected to center around the work at sea,” wrote Bigelow. 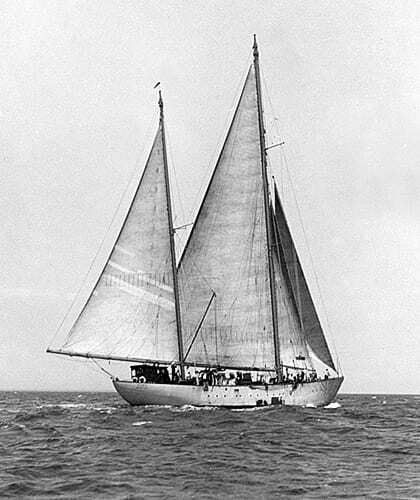 That statement eventually formed the centerpiece of the Institution’s longest-lasting (and continuing) legacy, one rooted in seagoing research to further knowledge of the ocean.In May 1930 the trustees authorized $175,000 for construction of a new vessel, a 142-foot, steel-hulled ketch spreading 7,500 square feet of canvas eventually christened Atlantis. Construction also began on a four-story brick laboratory, which is still in use and today called the Bigelow Laboratory. Atlantis was launched December 31, 1930, and arrived in Woods Hole in August 1931.Throughout the 1930s, the Institution operated primarily during the summer months. A typical summer would find Atlantis exploring newly discovered canyons off Georges Bank, collecting mud cores for bacteriological studies, taking current measurements at anchor stations, dragging for Gulf of Maine shrimp, collecting plankton, and crisscrossing the Gulf Stream taking water samples and making hydrographic measurements. During the winter, Atlantis generally made a longer cruise or two to the Caribbean or Gulf of Mexico.The turn of the decade, however, brought profound change to oceanography. During the war, the U.S. Navy realized that many of its operations were intimately dependent on the environment in which ships operate, and oceanographers found themselves consulted more frequently on matters of national defense.One of the first Navy-sponsored programs of research at Woods Hole concerned the composition of different paints to prevent marine fouling on ships, a project for which the Navy commended associate director Albert Redfield for helping them save an estimated 10 percent of their fuel budget. Another project involved the intensive study of the effects of salinity and temperature on the transmission of underwater sound and its application to anti-submarine warfare. 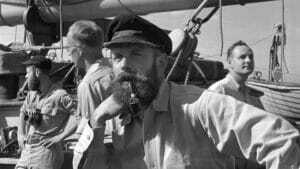 Many other research activities with direct application to naval problems followed, the largest of which was the investigation of underwater explosives.After the war, there was a period of uncertainty about oceanography’s future. For a while it appeared that the Institution might return to the pre-war routine of busy summers and quiet winters. But both the direction of oceanography as a science and its economic situation had changed, as had the demand for advanced research in the U.S.Throughout the Cold War, the Navy supported additional research that spawned greater knowledge of planetary and marine processes. Extensive work in physical oceanography led to better understanding of the Gulf Stream as well as the distribution of physical and chemical properties in the North Atlantic Ocean. Acoustic methods stimulated by wartime research allowed geophysicists to extend their knowledge and understanding of the structure of Earth’s crust under the ocean basins. Interest in meteorology led to the development of a strong group at Woods Hole making observations on trade wind physics and dynamics.In 1950, the U.S. Congress established the National Science Foundation (NSF) to promote national efforts in science and engineering. WHOI’s first support from NSF came in 1952 for work on summer plankton blooms in Long Island bays and for eight training fellowships. Over the years, NSF’s share of Institution support grew slowly and steadily until it surpassed Navy support. I think that the ocean should be studied as a thing for itself and as one of the most important things on Earth.